The Piemontese cattle breed is a beef breed of medium size that converts forage very well into beef and has a high dressing out percentage. The quantity of commercial cuts is higher than that of bigger-sized breeds as It has very fine bones. The cows are of a medium size (550 - 650 kg), at birth the calves weigh on average from 40 to 45 kg. The male fattening calves are ready for slaughtering at a weight of 550-680kg due to very good kill out percentages. Despite their size, the weight gain of Piemontese cattle is high, reaching above 2 kg a day in the calves between weaning and slaughtering, when feeding and environmental conditions are optimal. The indices of the food conversion are extremely high and confer to the Piemontese a feeding efficiency which stands well against all other beef breeds. The dressing out percentage is very high too, on average 64-68% in the fattening calves, with peaks of 72%, thanks to the extremely fine bones and the low quantity of external fat. The conformation of the carcasses is excellent: they are always classified E and U of the EUROP classification. 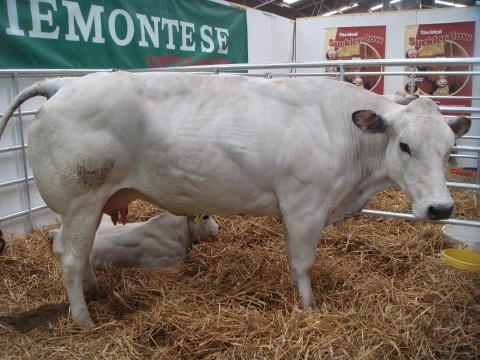 The milk production of the Piemontese is sufficient to suckle the calf; this as a consequence of the double-purpose selection applied on the breed in the past thanks to Anaborapi Italy. The particular characteristic of the Piemontese cattle breed is the muscular hypertrophy, better known as the 'double muscle factor'. The double muscle factor appeared at the beginning of last century. From a genetic point of view, the double muscle factor has always been considered a natural mutation which can occur in living organs, even if the probability is very low. The mutation which has taken place in the Piemontese breed is different from the ones of other breeds as it has a delayed introduction to the calf only becoming apparent a couple of weeks after birth so easing the calving process.